The chromosome 3q29 microdeletion syndrome is characterized by a clinical phenotype that includes behavioral features consistent with autism and attention deficit hyperactivity disorder, mild to moderate developmental delay, language-based learning disabilities, and/or dysmorphic features. In addition, recent data suggest that adults with chromosome 3q29 microdeletions have a significantly increased risk for psychosis and neuropsychiatric phenotypes. We report a 3-year-old male with global developmental delay, anemia, and mild dysmorphic facial features. Clinical chromosomal microarray (CMA) testing of the proband detected a heterozygous 1.21 Mb deletion at chromosome 3q29, consistent with a diagnosis of the 3q29 microdeletion syndrome. Interestingly, subsequent parental testing determined that the pathogenic deletion was inherited from his otherwise healthy mother who had a history of learning disabilities. The chromosome 3q29 microdeletion was not detected in the healthy older sibling of the proband by CMA testing, nor was it prenatally detected in a subsequent maternal pregnancy. 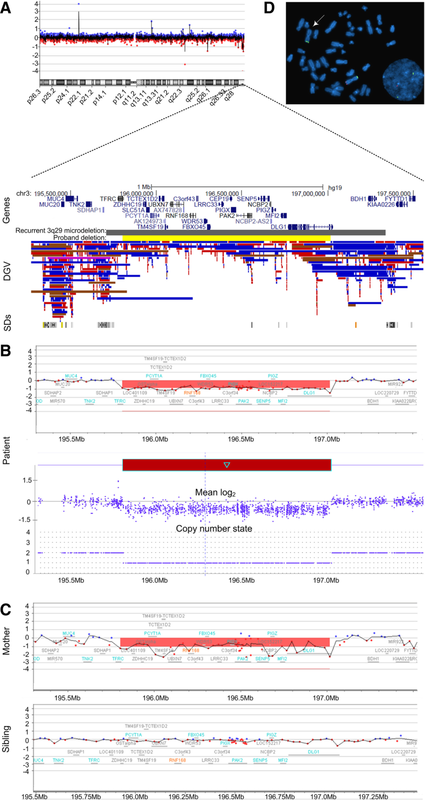 Our report highlights the 3q29 microdeletion syndrome as an illustrative example of the importance of a molecular diagnosis for families that harbor pathogenic copy number aberrations with variable expressivity, in particular those that also impart an increased risk for adult onset neuropsychiatric phenotypes. Chromosomal microarray (CMA) testing offers a powerful approach to detect submicroscopic copy number changes in the human genome [1, 2], which has led to the discovery of several microdeletion and microduplication syndromes [3, 4]. Moreover, clinically-relevant intragenic copy number changes are now also being discovered by large-scale genome sequencing efforts [5–7]. Importantly, some of these syndromes have incomplete penetrance and/or variable expressivity, which often result in nonspecific neurodevelopmental clinical features and challenging clinical diagnoses. The chromosome 3q29 microdeletion syndrome is characterized by a clinical phenotype that can include behavioral features consistent with autism and attention deficit hyperactivity disorder, mild to moderate developmental delay, and language-based learning disabilities . A subset of cases also present with microcephaly and mild dysmorphic features (e.g., elongated face, long fingers, and joint laxity) [9, 10]. The majority of 3q29 microdeletion syndrome cases occur de novo [11–15], which are most likely derived by the regional low copy repeats that act as substrates for non-allelic homologous recombination . The recurrent 3q29 microdeletion spans ~ 1.6 Mb with molecular boundaries encompassing the PAK2 and DLG1 candidate genes [8, 16]. Of note, inheritance from a mildly affected parent has also been reported among several independent families, including this index case (Table 1) [11, 14, 17–20]. This variable expression suggests that the incidence of the 3q29 microdeletion syndrome may potentially be higher than previously estimated (1 in 30,000-40,000) , as the constellation of features among certain families may not be clinically overt. Importantly, the 3q29 microdeletion is also one of the largest known risk factors for schizophrenia (~ 40 fold), surpassing even the recurrent 22q11.2 microdeletion syndrome . As such, accurate detection and molecular diagnosis of the 3q29 microdeletion syndrome is critical for proper genetic counseling and when providing neuropsychiatric risk information to affected family members. Herein, we report a child with global developmental delay and a chromosome 3q29 microdeletion, which subsequently was found to be inherited from his otherwise healthy mother who had a history of learning disabilities. This informative case underscores the utility of CMA testing for non-specific neurodevelopmental pediatric indications and highlights the 3q29 microdeletion syndrome as an illustrative example of the importance of a molecular diagnosis for pathogenic copy number aberrations with variable expressivity. The 3-year-old male proband was referred to Clinical Genetics for evaluation of a history of developmental delay. He was the second child of non-consanguineous parents of Mexican descent, and his pedigree was remarkable for a mother and maternal male first cousin who required special education mainly for learning disabilities. The prenatal history included a maternal chlamydia infection at 3 months gestational age (treated with antibiotics) and intrauterine growth restriction. He was born vaginally at 37 weeks gestational age, weighing 1.98 kg, and spent a total of 23 days in the NICU requiring nasogastric feeds and phototherapy. He walked and began to speak at 14 months of age and was subsequently diagnosed with global developmental delay by a behavioral pediatrician. He began early intervention services at the age of 2 years, receiving occupational, physical and speech therapy. At 3 years of age he was placed in special education classes getting speech and occupational therapies. At the time of his initial genetics evaluation, the patient could understand directions and point to body parts. He did not know the alphabet, colors, or numbers. In addition to these developmental delays, the proband has a history of anemia that is followed by his pediatrician. On physical exam, the patient was found to have a low anterior hair line. His palpebral fissures were slightly downward slanting, and infraorbital puffiness was noted. He has overfolded helices bilaterally, a broad nasal bridge, a wide grin and thin upper lip, which generally resembled the facial features of his mother (Fig. 1). Clinical Fragile X testing on DNA isolated from the proband was normal with 29 CGG repeats; however, CMA testing using the SurePrint G3 ISCA CGH + SNP 4 × 180 microarray (Agilent Technologies, Santa Clara, CA) [22, 23] detected a heterozygous 1.21 Mb deletion of chromosome 3q29 (reported as arr[GRCh37] 3q29(195804728_197016624)× 1) (Fig. 2). This microdeletion is smaller than the 1.6 Mb recurrent 3q29 microdeletion defined above, but still nested within its segmental duplication boundaries (Fig. 2). It included 28 genes and transcripts, and had only minimal overlap with copy number variants (CNVs) reported among healthy individuals in the Database of Genomic Variants (DGV; http://dgv.tcag.ca) . The interstitial chromosome 3q29 microdeletion was confirmed using the higher resolution CytoScan® HD platform (Affymetrix, Santa Clara, CA) and metaphase fluorescent in situ hybridization (FISH) using subtelomeric DNA probes (Fig. 2). Notably, familial CMA testing determined that the pathogenic chromosome 3q29 microdeletion was maternally inherited and not present in the healthy older sibling (Fig. 2), nor was it prenatally detected in a subsequent maternal pregnancy. The significance of structural variation in human disease and phenotypic diversity has increasingly become recognized, and several genomic studies have generated catalogs of CNVs to facilitate a better understanding of their clinical relevance [3, 25, 26]. It is estimated that up to 60% of the human genome may contain structural variants in the form of CNVs in the general population, which typically range in size from 100 bp to 50 kb , and clinical interpretation of these aberrations when identified by CMA testing is enabled by medical genetics practice guidelines . Larger copy number aberrations are more likely to be pathogenic, as are de novo variants; however, large-scale genomic studies on clinically relevant sequence variants and CNVs are increasingly underscoring the importance and interpretation challenges of incomplete penetrance and variable expressivity [3, 29–31]. We report a case of the 3q29 microdeletion syndrome in a 3-year-old male with developmental delay, which was found to be inherited from an otherwise healthy parent with a history of learning disabilities (Table 1). This educational case is an illustrative example of the importance of a molecular diagnosis for children with non-specific neurodevelopmental indications, particularly for families that harbor pathogenic copy number aberrations with variable expressivity. As indicated above, the recurrent 3q29 microdeletion syndrome has a heterogeneous clinical phenotype, and is enriched among young adults with psychiatric disorders and children with developmental delay [3, 32]. In particular, mild to moderate cognitive deficits, speech delay, low birth weight, a high nasal root, and ocular abnormalities are common findings (Table 1). Other less frequent features that can present with greater variability include facial asymmetry, frontal bossing, large protuberant ears, upslanting palpebral fissures, broad nostrils, and cleft lip/palate [11–15]. The 1.21 Mb deletion identified in our proband is nested within the recurrent ~ 1.6 Mb deletion and is one of the smallest 3q29 microdeletions reported to date using a high-resolution CMA platform; however, it directly overlaps with previously described pathogenic deletions at this locus . Additional 3q29 deletions nested within the recurrent microdeletion have also been described, either with a BAC or low resolution oligonucleotide microarray platform [12, 13, 17, 33]. A common pattern of moderate learning problems, speech delay, psychiatric disorder, and autistic features constitutes the primary phenotypic overlap in this cohort of smaller 3q29 deletions. A comparison of the genomic intervals between the 1.21 Mb deletion in our proband, the previously reported smaller deletions [12, 13, 17, 33], and the more common recurrent 1.6 Mb deletions indicates that all include the PAK2 candidate gene. The centromeric region of all deletions share the TFRC gene, which is also disrupted by the deletion in our proband and focally deleted in the recurrent deletion (Fig. 2). The telomeric region commonly includes DLG1; however, the recurrent larger deletions extend past DLG1 and into BHD1 (Fig. 2). Haploinsufficiency of these genes, in particular DLG1, has been implicated in some forms of schizophrenia and the behavioral characteristics of the 3q29 microdeletion syndrome [16, 17, 34]. In conclusion, our case presents a set of phenotypic features that add to the heterogeneous expression of the 3q29 microdeletion syndrome. In particular, the finding of anemia in our proband is uncommon among reported 3q29 microdeletion syndrome cohorts; however, given that the co-occurrence of anemia may be coincidental, additional patients are needed to confirm whether this is a rare feature of the 3q29 microdeletion. The familial inheritance of this pathogenic deletion and the phenotype of the transmitting parent is summarized with other reported familial 3q29 microdeletion syndrome cases in Table 1. Consistent among these families is a milder phenotype in the transmitting parent, often restricted to mild dysmorphic features and/or a history of learning/language delays. As the landscape of genomic variation in different populations continues to be defined, the importance of incomplete penetrance and variable expressivity are increasingly emerging. As such, the familial inheritance of this pathogenic deletion highlights both the clinical relevance of variable expressivity in genetic disease and the importance of clinician awareness, particularly for inherited aberrations that also impart an increased risk for adult onset neuropsychiatric phenotypes. The authors would like to thank the proband and family for supporting publication of this case report. The datasets generated during and/or analysed during the current study are not publicly available due to these data being derived from clinical genetic testing; however, deidentified data may be available from the corresponding author on reasonable request. WAK performed, analyzed, and interpreted the CMA and FISH testing; drafted and revised the manuscript. NC analyzed and interpreted the data and revised the manuscript. SAS interpreted the data, drafted and revised the manuscript, and oversaw the case report. EP performed the clinical evaluations, interpreted the data, drafted and revised the manuscript, and oversaw the case report. All authors approved the final manuscript as submitted and agree to be accountable for all aspects of the work. The family provided written informed consent for the clinical genetic testing performed in this study through the Pediatric Genetics Clinic at Jacobi Medical Center. Informed written consent was obtained for publication (including images) from all family members involved in this study. A copy of the written consent is available for review by the editor of this Journal. WAK and SAS are paid employees of Mount Sinai Genomics Inc. (DBA Sema4). All authors declare no competing interest.